When heated to just above room temperature, the electrical conductivity of vanadium dioxide (VO2) abruptly increases by a factor of 10,000. Experiments coupled with high-performance computation reveal how the unusually large lattice vibrations, which are the oscillations of atoms about their equilibrium positions, stabilize this highly conductive metallic phase. Achievement of a quantitative description of phase competition and functionality in metal oxides could pay great dividends in the quest to predictively design materials with unique properties. 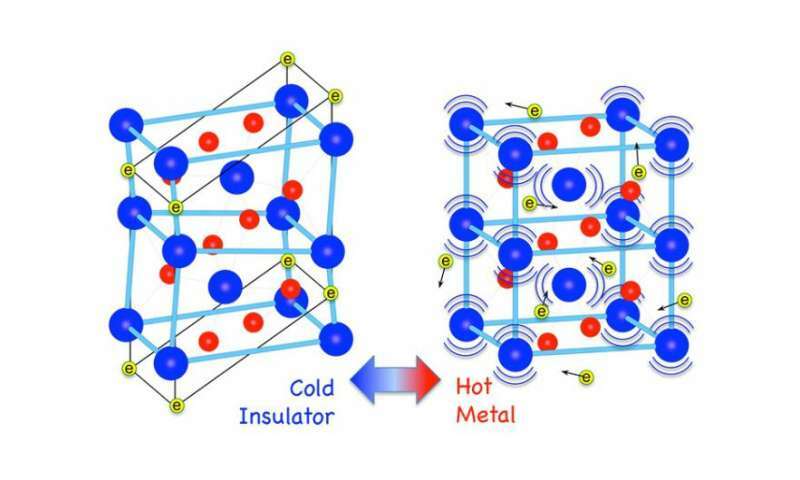 Vanadium dioxide (VO2), a "functional material" that could be used in applications such as smart windows and ultrafast field effect transistors, exhibits an insulator to metal transition upon heating to just above room temperature. At the transition temperature, its electrical conductivity abruptly increases by a factor of 10,000 and the atomic lattice rearranges from a monoclinic to a tetragonal structure (see figure). A fundamental description of the physical and electronic properties during the transition in VO2 has remained controversial for over 50 years. Researchers at Oak Ridge National Laboratory employed advanced neutron and X-ray scattering experiments at DOE user facilities, coupled with large-scale first-principles calculations with super computers, to determine the detailed mechanism for the transition. Their studies, published in Nature, revealed that the thermodynamic force driving the insulator-to-metal transition is dominated by the lattice vibrations (phonons) rather than electronic contributions. In addition, a direct, quantitative determination of the phonon dispersions was achieved, as well as a description of how changing occupancies in the atomic orbitals participate in the phase transition. The low-energy phonons were found to change the bonds between atoms (i.e., electron orbitals), allowing some electrons to travel freely at higher temperatures leading to a metallic state. This research demonstrates that anharmonic lattice dynamics play a critical role in controlling phase competition in metal oxides, and provides the complete physical model vital for the predictive design of new materials with unique properties. This is excellent work by Budai and his team. I am interested in a specific question: why do the vibrating atoms prefer the specific box like shape shown in the right side diagram? All vanadium angles are equal, at 90 degrees. In the left hand picture, vanadium angles are unequal. In my opinion, the equal angles stem from Art Winfree's law of coupled periodic oscillators, which he proposed in 1967. The blue atoms here are oscillating in a periodic fashion. Winfree's law says that in such a case the oscillating parts (the vanadium atoms) will distribute their oscillations equally within their system. Thus, equal angles. Which, in turn, force some electrons to give up roles that they perform in the insulator version (left side model). The same Winfree principle applies in the left hand model, but there it applies at the level of the electrons (yellow), not the atoms, because the electron oscillations are superior at that temperature.